Like the loss of an ailing loved one, it was inevitable but a shock all the same at the end. The announcement on Monday that GM will close its Oshawa plant in 2019 as part of a global restructuring shakes this city to the core. 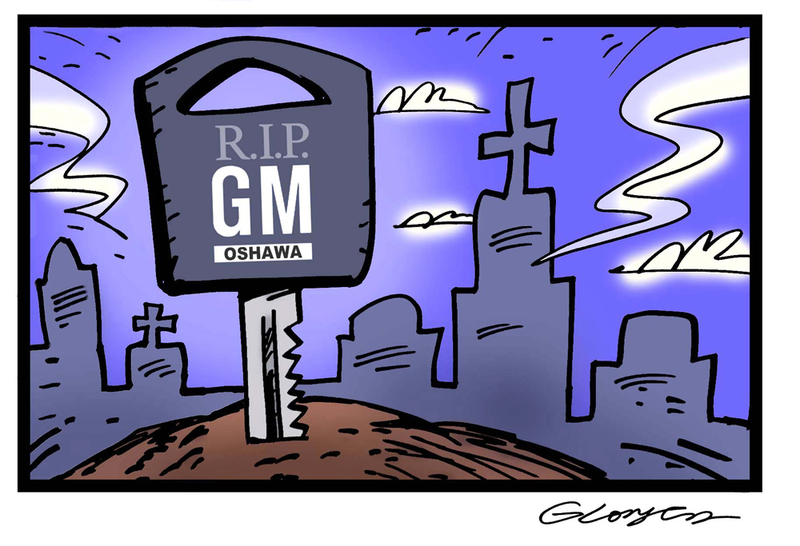 GM has been the thread of Oshawa for almost a century. It was woven extensively through this city, so deep its roots ran, we don’t know the economic fallout yet to come when GM finally ceases to exist here. But the city has had years to plan for this inevitable closing as GM has continued to dwindle from its glory days of 30,000 plus employees and all those people employed throughout the city in subsidiary feeder plants. We’ve had the opportunity to become accustomed to a lesser and more precarious GM through years of attrition. Oshawa has tried to reinvent itself by remaking it into a city of information and technology. Just look at the college and universities here. But there’s a massive chunk of the Oshawa landscape that will need to be revitalized, not just for economic reasons. Unfortunately, GM is not the only casualty in the vastly changing economic climate in the world today. Brick and mortar stores are succumbing to the pressures of internet sales. This month alone, Lowe’s has closed some stores and the home décor chain of Bowring and Bombay, both drowning in debt, are selling off all goods to cease operations. And we all remember the outcome of Sears last fall. There will be more to come. The internet has been a bully to traditional business while it has been a boon for others who have been able to adjust to a new way of thinking. So, even though it has its many benefits, it has also created a dubious economy for those left in its wake. The old way of doing business just doesn’t cut it anymore. Consumers have no loyalty and even more troublesome is the lack of regard to how their purchases support an economy not usually related to this country. But the internet is not the issue with the impending loss of GM. There is so much more involved globally. History and sentiment no longer play a role in the bottom line of companies in an effort to keep competitive. That’s life. Here in Oshawa, we already have a head start. It has been a slow and steady decline of the city’s once largest employer, so we have been given an opportunity to prepare to deal with this loss. No one likes change but we are in a changing world and we need to move forward to fill the void that was once GM. And in the future, let’s support our own businesses. They are the ones who will give back directly in return.